This drawing depicts, from left to right, two episodes of the fable of the bull, the tiger and the palm-wine tapper called Papaka. In the first scene of the fable - depicted in another drawing in the same series - the tiger boasts that he is of higher rank than the domestic bull because he is fearless and eats animals and men. The tiger pretends to have the right of devouring the bull. The latter tells him that the human being is the highest being on earth and because a man can easily kill a tiger, the tiger has no right to kill the bull and eat it. To illustrate his point the bull speaks about the wisdom and the abilities of men and suggests that the tiger goes to the palm-wine tapper Papaka to verify what he has claimed. At the end of the fable the tiger is defeated by this palmwine-tapper, who is inspired by the gods. Papaka succeeds in tying the tiger up to a palm-tree – this scene is depicted in the drawing above. The moral of this fable is that men are superior to animals because they represent the gods on earth. 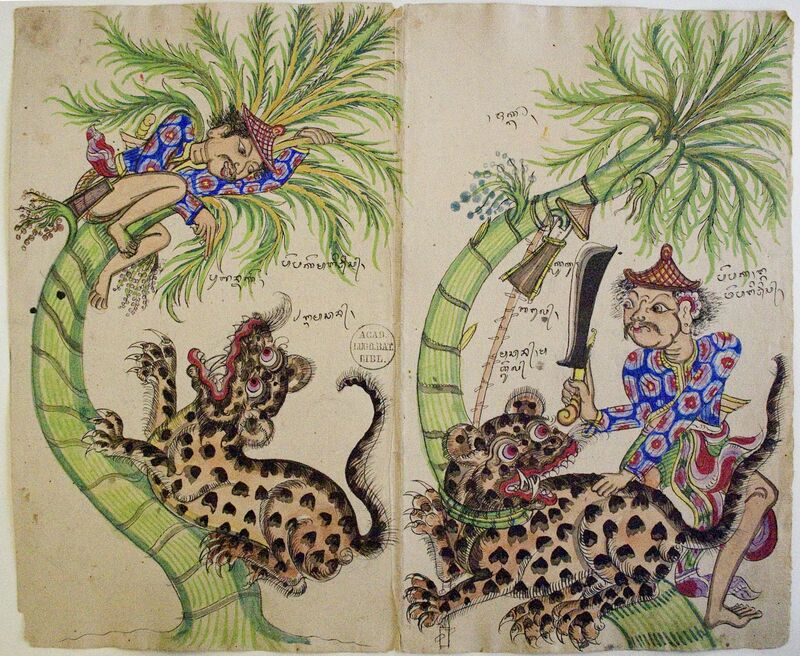 This drawing is part of a collection of 483 Balinese drawings on paper, donated to Leiden University Library as part of the legacy of the great scholar Herman Neubronner van der Tuuk (1824-1894). Van der Tuuk worked from 1870 in Bali, until shortly before his death in the Military Hospital in Surabaya. Apart from the Balinese drawings, he also bequeathed his collection of manuscripts, scholarly notes, library and photographs to Leiden University Library, thousands of items altogether. Part of this legacy is described in the Catalogue of Malay and Minangkabau Manuscripts in the Library of Leiden University and other collections in The Netherlands (Volume Two) by Prof. Dr. E.P. Wieringa. The drawings were executed at the instigation and under guidance of Van der Tuuk, who provided the Balinese artists with the necessary materials. Most of the drawings are annotated in Balinese. It is very likely that Van der Tuuk intended to use them, or at least a selection, to illustrate his impressive Kawi-Balineesch-Nederlandsch woordenboek (Old-Javanese-Balinese-Dutch dictionary), that he prepared in Bali. His illness and death prevented him to bring this project to an end. His dictionary was posthumously published in four volumes between 1897 and 1912, but the editors did not make use of the drawings.